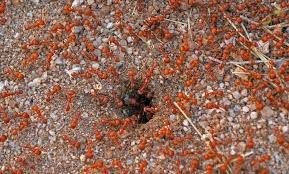 Life For Animals: Ants fighting Global Warming!! That every creature on Earth is here for a purpose, and that we must not kill any of them, has been proved right again. According to the journal Geology, ants may be cooling the Earth by helping trap carbon dioxide from the environment! A long-term experiment tracking the ants’ effects on soil suggests they cooled Earth’s climate as their numbers grew. Certain ant species “weather” minerals in order to secrete calcium carbonate, better known as limestone. The process traps and removes a tiny bit of carbon dioxide gas from atmosphere. This ant limestone factory is a small-scale version of the massive planetary-cooling process that takes place in the oceans, known as carbon sequestration, according to a report. It was discovered that ants were powerful weathering agents by tracking the breakdown of basalt sand. The experiment also shows that ants appear to break down the minerals 50 to 300 times faster than sand left undisturbed on bare ground. There are other scientific explanations given in the report about how ants do it. But the important point is that every creature on Earth is here for a purpose. To kill them, eat them and torture them is against humanity and against divinity. God and nature have blessed us with animals to save us from calamities which we must understand and respect the existence of animals.